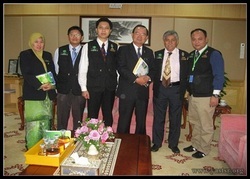 On 10 January, 2011 Tunku Syed Razman Environmental Foundation held a meeting with the Minister of Energy, Green Technology & Water. A Presentation was made by the Foundations Subsidiary company Arena Agro Technology Sdn Bhd. An introduction was made about the processing of Bio Diesel and the prototype machine called RAZAK BIO1 in conjunction with the recognition of the Father Of Developments of Malaysia, the former 2nd Prime Minister of Malaysia, Tun Abdul Razak.